We’ve been told that the summer is the busiest time of the year, and that things, in general, slow down in the winter. And, thus far, the summer has certainly been busy. But, for the few weeks that followed R&R, I had quite a bit more going on than the rest of the summer. It started with the fact that Jim, the guy that I met up with in MacTown, wasn’t able to come to the Pole because of population issues. He’s the person that I am most in contact with at Biospherical (BSI), a sub-contractor of Raytheon’s. 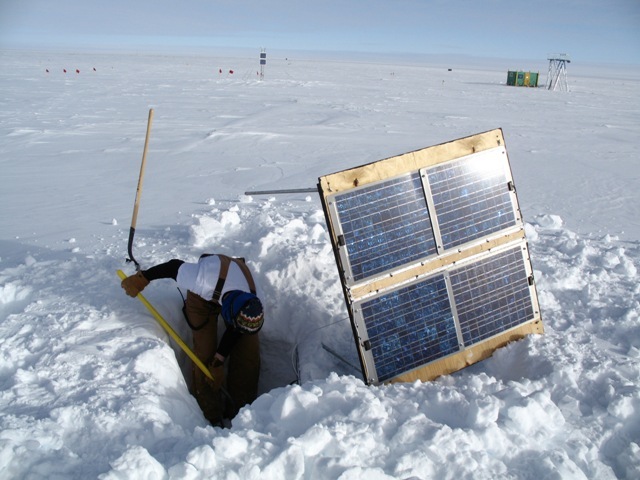 His instrument at the Pole is a spectraoradiometer, which measures the intensity of light across the UV and visible light wavelengths. I’ll get more into detail at some point in the winter when things have slowed down. Anyway, Jim (or someone else from BSI) normally comes down once per year in order to perform yearly calibrations and do general maintenance. But, since he couldn’t come down, I was responsible for taking care of what needed to be taken care of. I spent several days on that, including an 11-hour day at ARO doing a particular set of calibrations. In addition to that, during the first week of February, two sets of Grantees were here. One was setting up an extension to a project that has been running for the past year. It’s a demonstration of a thermally insulated electronics package. The idea is to keep an electronics package warm all year round. This year, they developed a new package in hopes that it will be better insulated. So, while the Grantee was here, we set up the new container, which was an approximately 4’x4’x3’ crate with a dewar inside. We then had to dig up the existing container, which had been buried the previous season, and had accumulated about three feet of snow on top of it. We also had to dig up all the cabling that went between the old container, the nearby solar panel, and ARO. The trick there was to not sever the cables with our shovels, so it was pretty slow going. Once we had everything dug up, we used a pump to transfer a melted-candle-wax-type oil from the old container into the new container. He had brought a pump, but it was more of a challenge than you’d think because of the cold. Luckily they had decided not to bury the new container. At any rate, that kept me busy for a couple of days. The other set of Grantees had a much more ambitious schedule. 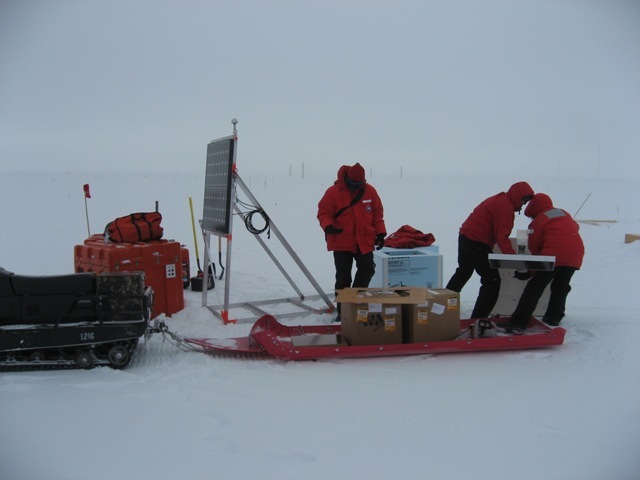 They were deploying two seismometers along with associated electronics and GPS receivers. This involved about a pallet’s worth of cargo, which all had to be assembled, brought out to the site, connected, buried, and checked out in the matter of a week. 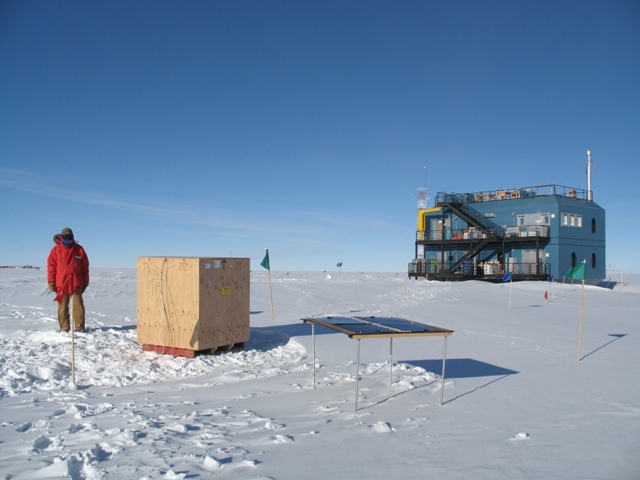 We got them set up in one of our DNF (do not freeze) facilities where they could put together the electronics and batteries within their orange insulated crates that would be placed at the site. They worked on that for a couple of days, and I stopped by a few times so that I could get an idea of what the set up looked like, and to offer any help that I could give. At that point, we need to drag everything out to the site. So, I got a snowmobile from Cryo Nick and a sled from Cargo. It took a few trips out to get everything. There were a couple of eyebrow raising comments from one of the Grantees during the in-brief at the beginning of the week. One was that he thought we could just man-haul everything out to the site. Well, he was right, we could have, but after seeing how much stuff they had, I was more than glad that we had the snowmobile and sled in tow. It took three or four trips to get everything, and we still had to bring a couple of loads over the next couple of days. With everything now out at the site, it was time to dig. 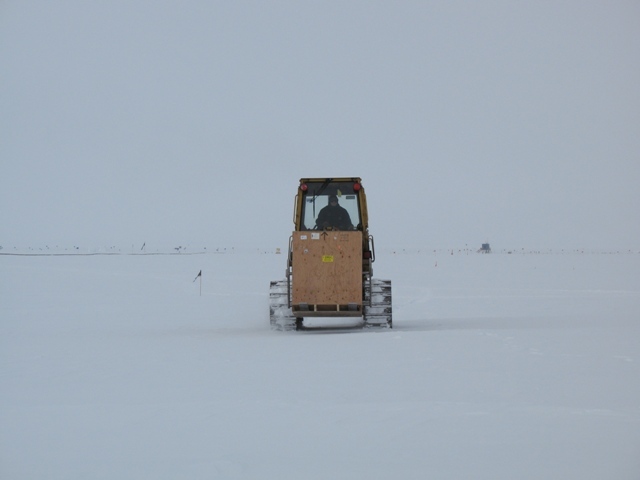 We had strategically located the site so as to avoid buried cables, so that wasn’t too much of a concern this time (although you never know around here; there’s cables buried everywhere). 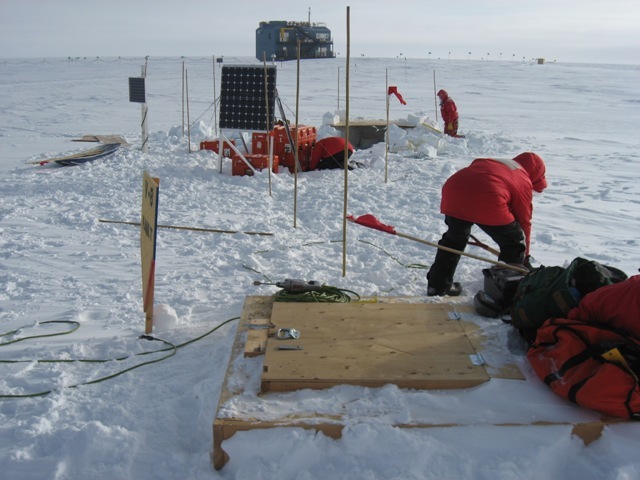 We had three fairly hefty insulated orange crates that needed to be half buried, two solar arrays that needed to be anchored, and to top it off, two seismometers that needed to be buried about five feet under. 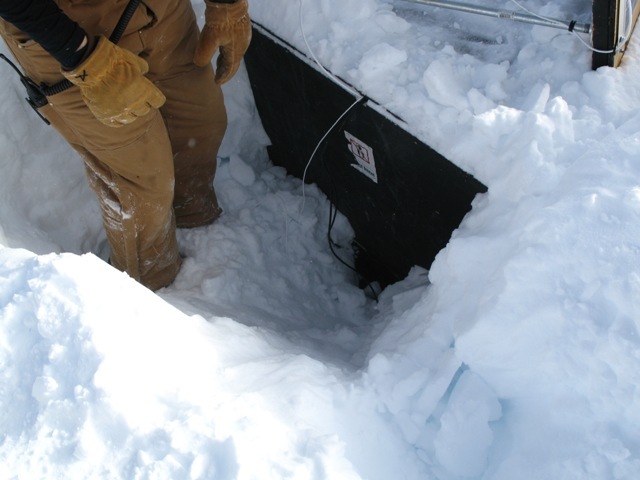 This was the other eyebrow raising comment; he said, well, we need to bury the two seismometers, which will require two holes that are at least five feet deep, so that’ll take us about an hour and a half, just give me a chainsaw. We thought, more like a day and a half. He didn’t quite get it done in an hour and a half, but much to his credit, he did have one hole just about dug in the first afternoon. He really went at it with the chainsaw, it was an impressive site. After a couple of feet down, the snow more resembled cement than it did snow. Be he just kept pulling blocks out while the rest of us worked on starting the second hole, setting up the orange boxes, digging trenches for the cables, and anchoring the solar arrays. It was a tough afternoon, and most of the next day’s worth of work, but we eventually got it all set up and working. It was fun to be a part of the project set ups, and to get to do some work that was out of the ordinary for me. It was also nice to see the projects a bit more detailed that I normally get to. But, after it’s all said and done, I’m looking forward to the quieter days of winter.